Packing – we all loathe it. It’s especially loathsome when you actually arrive at your vacation destination and discovered that you forgot something essential at home. If this has happened to you, you’ll want to download this app: PackPoint. 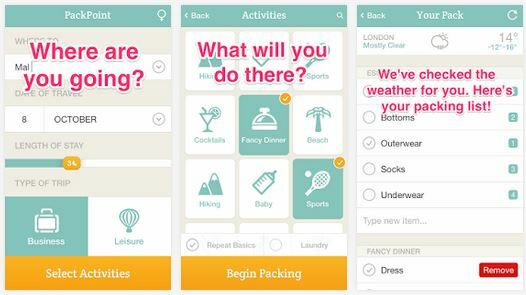 PackPoint is a free Android and Blackberry app that makes packing easier by helping you set up your packing lists by the type of trips, and activities you’ll be doing. There’s also a way to incorporate the forecast, if there’s rain or snow. Basically, a fun way to get out the door without going crazy.